To fans of Japanese food, tempura, sashimi, sushi, and ramen are all well-known menu items. But a lesser-known and more traditional kind of cuisine has so far remained unknown to overseas gourmets. Robatayaki, or robata for short, is a style of Japanese cooking which originated centuries agos. Fishermen in Japan encased hot charcoal in boxes, creating portable heat sources atop which they could grill their catches even while still at sea. Story has it that some fishermen placed these coal-filled boxes on their oars to grill seafood during the day. Paying tribute to legend, robatayaki places often serve their dishes using wooden, oar-like paddles called shamoji. Today, robatayaki menus often feature skewered seafood, vegetables, and meats. And according to Savor Japan, at robatayaki restaurants, presentation and atmosphere are just as crucial to the concept as the quality of the food. 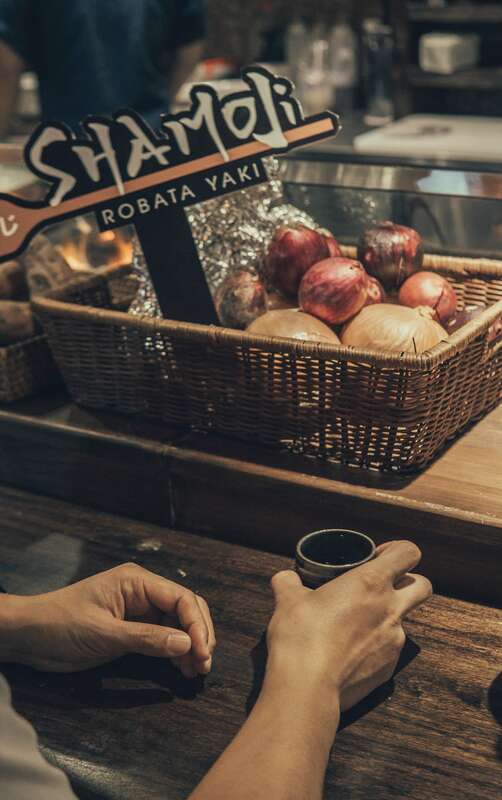 Shamoji Robata Yaki is Saigon’s first robatayaki restaurant chain, which opened recently as a tribute to a growing interest in Japanese culture within Vietnam. The restaurant’s CEO, Yen Mai Linh, drew heavily on Japanese traditions and the support of Japanese food and beverage consultants Mugen in crafting its ambiance and menu. Mugen’s CEO Masahiro Uchiyama was in town for the opening of Shamoji’s third restaurant on Nguyen Hue. So Vietcetera met up with Masahiro and Yen Mai Linh to explore what makes Shamoji an exciting new concept for the city. Yen Mai Linh: My name is Yen Mai Linh, and I am currently the CEO of Mylife Company as well as founder of Shamoji Robata Yaki. We work in the restaurant, cafe, and interior design industries. I graduated from Ho Chi Minh City’s University of Technology with a degree in food chemistry and later received an MBA from Maastricht University. In 2006, I started my first business under the name Mylife Coffee. Today Mylife Company owns brands from Yen Sushi Premium, Yen Sushi Sake Pub, and Mylife Coffee, to interior brand Mylife Homefashion and Shamoji Robata Yaki restaurant. Masahiro Uchiyama: I’m a person who likes to explore and experience new things—especially food. So, before going to a country, I often learn about culture, about typical dishes. A small secret I have for you is to ask the local people where you go to eat and what special dish it is there. It is a great way to access authentic local dining experiences. At Mugen, we look to bring happiness to customers through food. But our customers are not just the diners in our concepts. By customers, I also mean the farmers and fishermen who work day and night to create the best raw materials. Making them happy is something we also aim to do at Mugen—which makes me proud. So, I first met Linh in Japan. Then, I heard about her enthusiasm and aspirations about wanting to bring Japan’s Robatayaki model to Ho Chi Minh City and I was very grateful to Linh’s wish and dedication. 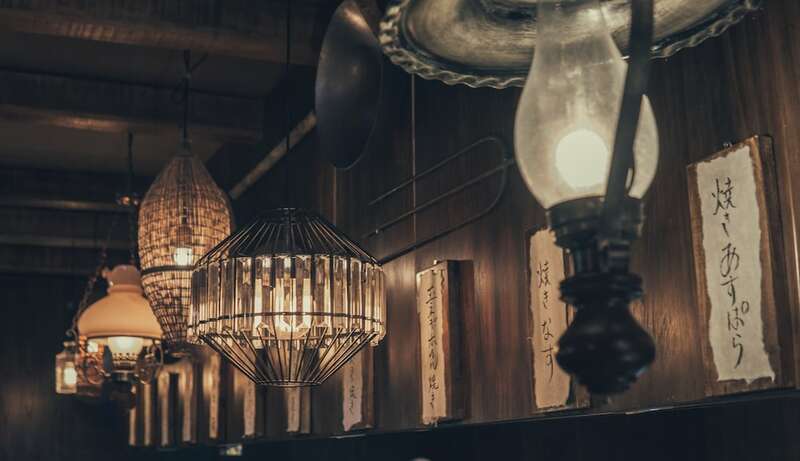 The decor at Shamoji is filled with the Japanese spirit of wabi-sabi. So, can you curate a dining experience at Shamoji by telling us what to order and why? Yen Mai Linh: Like they do in Japan, at Shamoji we feature menu items that highlight seasonal ingredients. We want our customers to be able to enjoy the flavors of all four seasons as they occur in Japan. One dish you have to try is our Hamayaki saba. The fish is placed onto a bamboo skewer, sprinkled with salt, and eaten with a simple salad. This meal is simple and delicious. Masahiro Uchiyama: I would recommend you try the grilled tuna steak, which is only available when Shamoji hosts performances. It’s famous in Japan, and we hope to bring an authentic experience to our guests. The tuna is cleaned first, then baked on a straw fire such that only the outer layer burns. The inside of the fish is still fresh. When you enjoy this dish you should notice the fragrance left behind by the straw and the sweetness of the fresh fish blended with ponzu sauce and basil. Tell us more about the restaurant, Shamoji Robata Yaki, and its concept. Yen Mai Linh: Robata in Japanese means “around the fireplace”, and Yaki means “grill”. Traditionally, Japanese families would often gather around their fireplace to eat barbecue and drink sake after a trip at sea. There they would eat from silverware contributed by family members, coming together to create a dining space that is at once intimate and inviting. Eventually this shaped the drinking culture of the Japanese people. After a trip at sea, families and friends would drink together and chat. And because family members brought their own cups to share, the group would drink from all kinds of cups. This is the reason why, at Shamoji Robata Yaki, our cups and decor are not as perfectly synchronized as in other restaurants. We try to draw from this Japanese drinking culture to create a kind of rustic, nostalgic beauty. 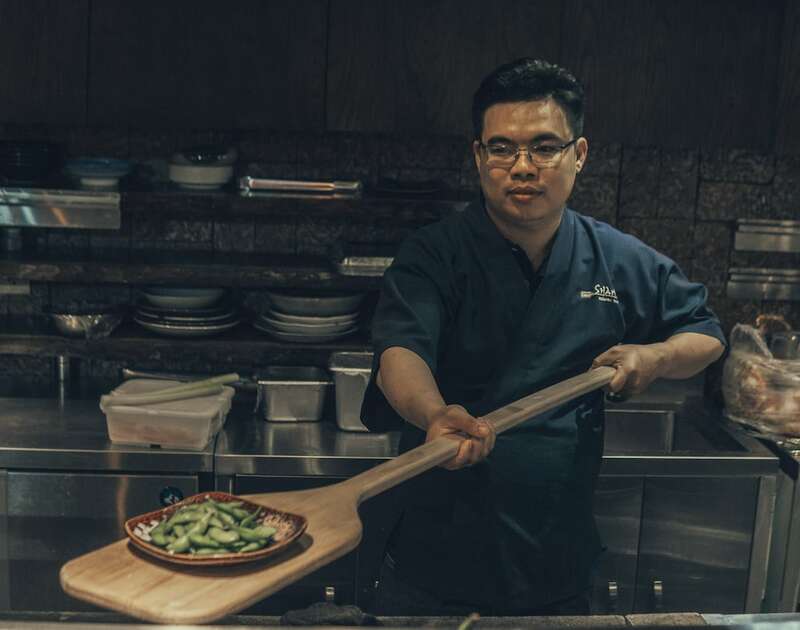 We also have an open kitchen so customers can see the ingredients we put into their food, how we prepare it, and where we use the shamoji, or “big wooden paddle”, to serve them their meals. Masahiro Uchiyama: We also research the market we want to work with to thoroughly understand the products and services we want to offer to customers. With Linh’s understanding of the market here, we could focus on the quality of the products and the quality our their services. Why is Shamoji’s doorway so low to the ground? Masahiro Uchiyama: At our No. 1 restaurant in Tokyo, there is also the same small door design. We got the idea from the entrances of traditional tea rooms. In the Edo period, the generals, martial artists and soldiers all carried swords, but when entering the tea ceremony room because the door was designed so small, it was necessary to abandon the sword to get inside. 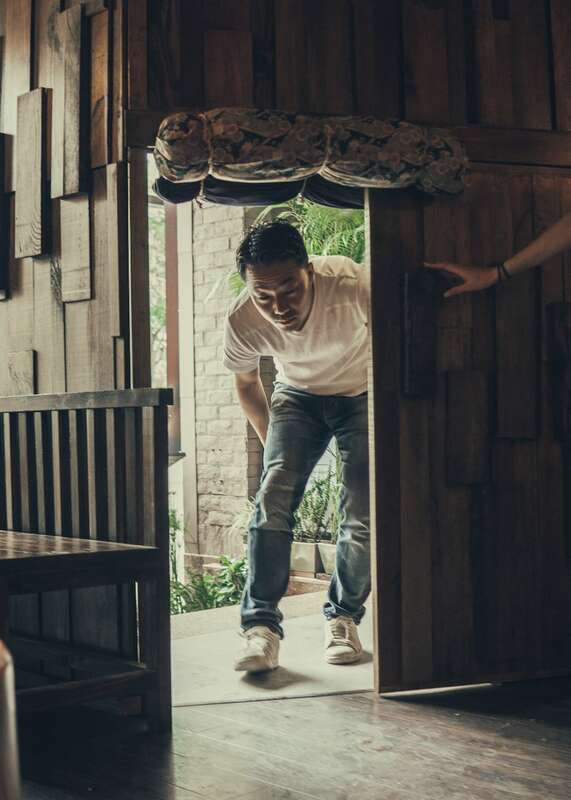 Yen Mai Linh: The restaurant has plenty of features that distinguish it from other establishments in Vietnam, and one of the quirkiest parts of the design is our door. For people who haven’t visited Shamoji, our entrance is a sliding wooden door. It’s like the door to a traditional Japanese home. We decided to build the door so low to the ground to surprise our customers—they have to focus when they’re entering, and as soon as they get their bearings inside, they’re stunned by the look of the space. It’s like a scene from Alice in Wonderland. Once you make it inside the restaurant, you see a warm, open kitchen, lively chefs and staff, and our signature shamoji. A selection of the drinks available at Shamoji. “20 years ago, in Japan, sake and then shochu were popular, but that moved on to wine, then whiskey, and now it’s NihonShu,” Masahiro explains. Shamoji, in addition to serving delicious food, takes pride in the process of cooking. For example, the restaurant shows customers how it burns straw and pounds mochi to produce different dishes. Why did you decide to incorporate this? 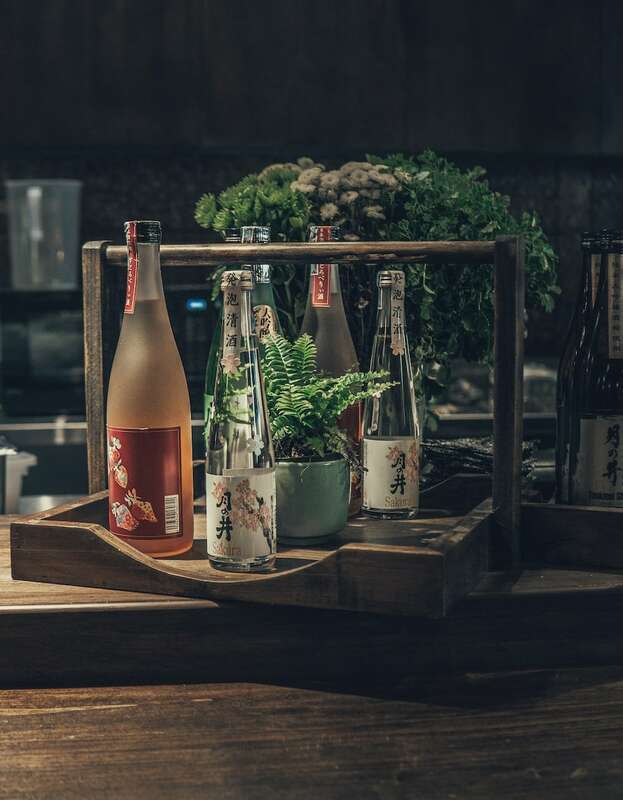 Masahiro Uchiyama: To recreate the feel of a traditional Japanese pub space, we wanted to showcase the processes necessary to produce our food and drink. Our pounding mochi and grilling tuna over a bed of straw only adds to customers’ experiences. Yen Mai Linh: Many of our customers enjoy this kind of program because they can experience Japanese culture without having to leave Vietnam. Nonetheless, I believe that the quality of the dishes and the service are the main reasons why the restaurant has found success. 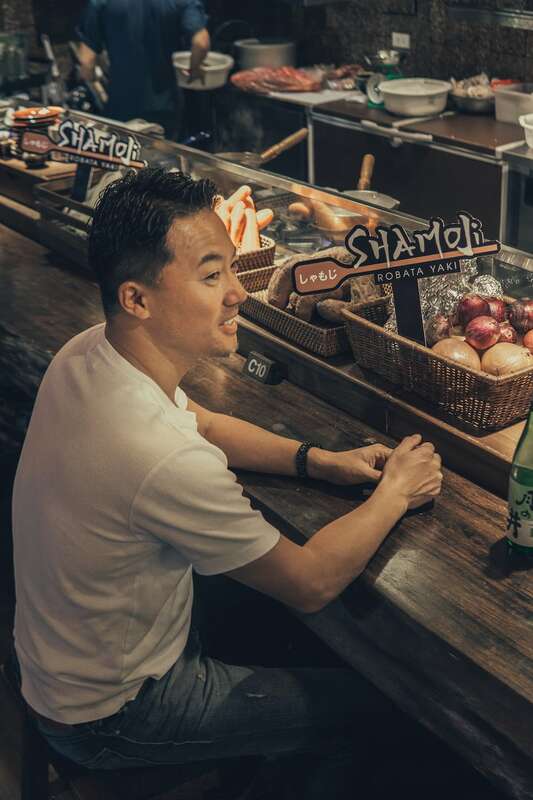 Mugen CEO and consultant for the Shamoji restaurants Masahiro Uchiyama sitting at the long wooden counter. Shamoji attracts a diverse range of customers. How do you think it manages to do that? Yen Mai Linh: We see Shamoji is a pioneering brand, showcasing Japanese cuisine and traditional “izakaya” culture. We’ve paid attention to every detail, from the building’s architecture, to our furniture and silverware, and the presentation of food. We also care deeply about the quality of our dishes. To make sure our food is excellent, we carefully source and check all of our ingredients before cooking with them to ensure their compliance with Japanese standards. I think that customers recognize this, and this is why they decide to return to our restaurant. As long as we continue to put in the effort, we trust that people from all kinds of backgrounds will want to eat at Shamoji. Maybe it’s the design of the restaurant, or maybe it’s a combination of the food and the decor, but we’ve noticed that Shamoji manages to create a lot of Instagram moments. Was this something you had in mind when you came up with the Shamoji concept? Masahiro Uchiyama: When we were developing our plans for the restaurant together, we had no intention of using Japanese cultural elements just for Instagram. 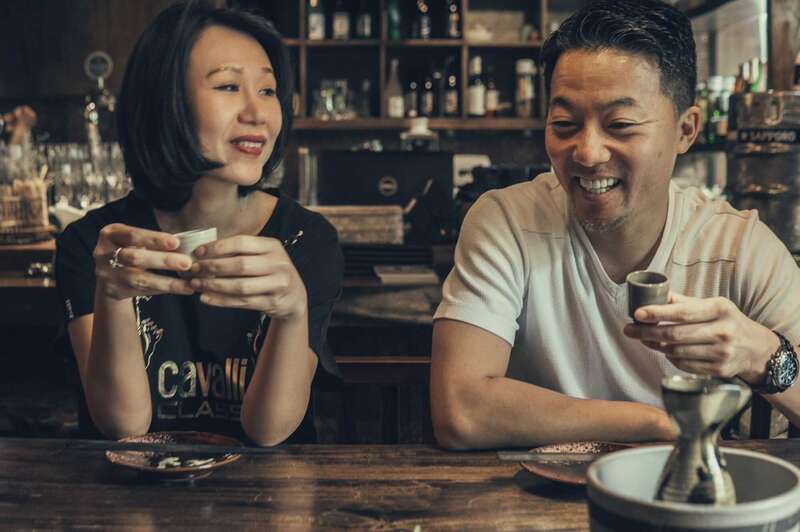 It was a coincidence that the characteristics of Japanese “izakaya” culture that we loved and aimed to recreate also happened to feature well in people’s photos. Yen Mai Linh: Young people have likely been drawn to our restaurant because of how immersive it is. When you enter, you really do experience an ancient and far-away tradition. We were only able to pull off this design because of my and the rest of the team’s genuine passion for Japanese culture. What advice do you have for someone opening a new restaurant in Ho Chi Minh City? Yen Mai Linh: When you start any business, you need to study the playing field thoroughly. The food and beverage industry is no exception. Research the market you hope to work in until you thoroughly understand its products and services, as well as its customers. And don’t forget to focus, above everything, on the quality of your food and hospitality. Quality is everything. Which restaurants do you visit for inspiration? Masahiro Uchiyama: I have to admit, my favorite is Japanese food—especially sushi. For the best sushi I go to Tokyo’s Hatsune Zushi. The reason I like this restaurant is because its chefs are like artisans. They stand in the middle as if they’re standing on a stage and performing for the customers around them—carrying out meticulous processes one after the other every lunch and dinner service….